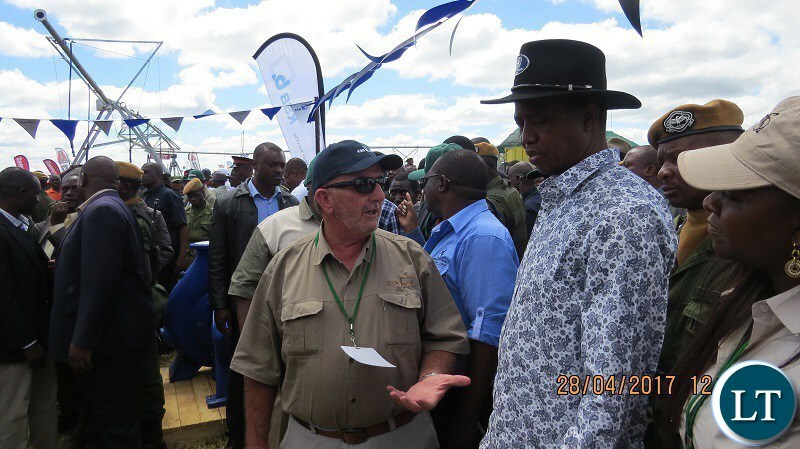 President Edgar Lungu will attend the official opening of the Agritech Expo Zambia outdoor farming exhibition that returns for the fifth time to Chisamba from 12-14 April. The event is expected to attract more than 22,000 visitors this year and will feature some 270 local and international agri equipment and services suppliers. The theme of the President’s address during the opening ceremony on Friday, 13 April, will be: “Resilience part of Zambian nature: Applauding every step forward towards the modernisation of Zambian agriculture”. President Lungu will be joined by Fisheries and Livestock Minister Kampamba Mulenga and Agriculture Minister Michael Katambo. Is Chisamba the only place where they can be holding this event? To promote agriculture they should rotate the hosting of this event- Mkushi in Central, Kalomo in Southern, Lundazi in Eastern, Kabompo NWestern, Mpika in Northern/ Muchinga, Lufwanyama and Mpongwe in the Copperbelt, Senanga in Western, Kawambwa in Luapula and Chongwe in Lusaka. These areas I’ve mentioned are provincial farming areas and are the best places to showcase farming technology. This is very progressive and fully supported by the farmers’ representative ZNFU. ignore this moron 2020Vision, as usual always looking for faults. ni ba sembe ni hh. Chisamba is the only place where there is a concentration of commerical farmers who can afford these highly sophisicated tractors..modern tractors are like a cockpit of an airbus aircraft. Chisamba is the only place where there is a concentration of commerical farmers who can afford these highly sophisicated tractors..modern tractors are like a co.ckpit of an airbus aircraft. Another chance for him to read his usual silly speeches about how PF govt is diversifying the Zambian economy into agriculture yet he is wasting over $900 million on overpriced Ndola-Lusaka building irrelevant hotels along the carriageway. Lazy Lungu just wear a hat and climb on a tractor for a photo opp useless bum. The most dishonourable man to be at the helm of this country. He looks forward to climbing on a tractor and wearing a hat every year without shame…he is a waste of space the lazy thing!! @2020 vision, it’s very costly to host or even attend this event, Chisamba has land accessible by all. Smaller ones are always available at provincial level.